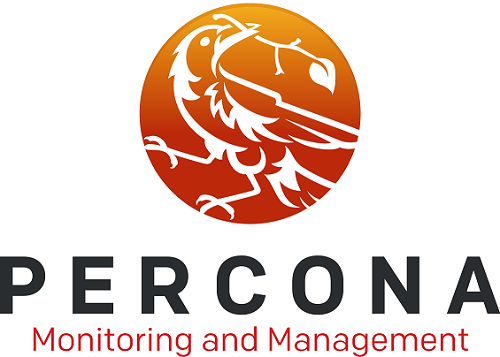 PMM (Percona Monitoring and Management) is designed to be scalable for various environments. If you have just one MySQL or MongoDB server, you can install and run both PMM server and PMM clients on one database host. PMM, at a high-level, is made up of two basic components: the client and the server. The PMM Client is installed on the database servers themselves and is used to collect metrics. The client contains technology specific exporters (which collect and export data), and an “admin interface” (which makes the management of the PMM platform very simple). The PMM server is a “pre-integrated unit” (Docker, VM or AWS AMI) that contains four components that gather the metrics from the exporters on the PMM client(s). 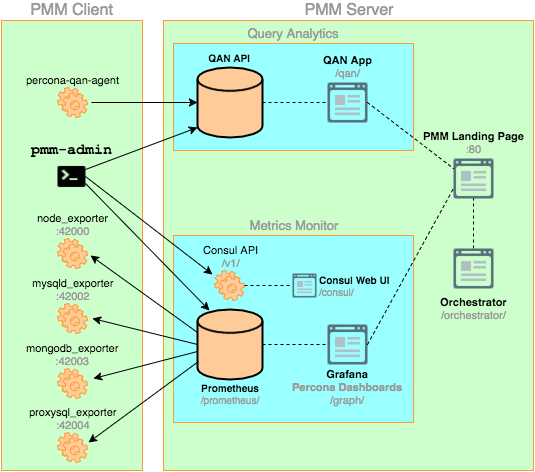 The PMM server contains Consul, Grafana, Prometheus and a Query Analytics Engine that Percona has developed. Here is a graphic from the architecture section of our documentation. PMM Client installed on every database host that you want to monitor. It collects server metrics, general system metrics, and Query Analytics data for a complete performance overview. PMM Server is the central part of PMM that aggregates collected data and presents it in the form of tables, dashboards, and graphs in a web interface. Any system which can run Docker version 1.12.6 or later. Minimum memory is 2 GB for one monitored database node, but it is not linear when you add more nodes. For example, data from 20 nodes should be easily handled with 16 GB. Any modern 64-bit Linux distribution. It is tested on the latest versions of Debian, Ubuntu, CentOS, and Red Hat Enterprise Linux. In this article we will be installing PMM using docker. The following ports must be open to enable communication between the PMM Server and PMM clients. PMM Server should keep ports 80 or 443 ports open for computers where PMM Client is installed to access the PMM web interface. On each computer where PMM Client is installed, the following ports must be open. These are default ports that you can change when adding the respective monitoring service with the pmm-admin add command. 42000 For PMM to collect genenal system metrics. 42001 This port is used by a service which collects query performance data and makes it available to QAN. 42002 For PMM to collect MySQL server metrics. 42003 For PMM to collect MongoDB server metrics. 42004 For PMM to collect ProxySQL server metrics. Restart the linux server for changes to take effective. This step is not required if you are running PMM Server for the first time. However, it ensures that if there is an older version of the image tagged with latest available locally, it will be replaced by the actual latest version. The docker create command instructs the Docker daemon to create a container from an image. The -v options initialize data volumes for the container. The –name option assigns a custom name for the container that you can use to reference the container within a Docker network. In this case: pmm-data. percona/pmm-server:latest is the name and version tag of the image to derive the container from. The docker run command runs a new container based on the percona/pmm-server:latest image. The -d option starts the container in the background (detached mode). The -p option maps the port for accessing the PMM Server web UI. For example, if port 80 is not available, you can map the landing page to port 8080 using -p 8080:80. The -v option mounts volumes from the pmm-data container (see Creating the pmm-data Container). The –name option assigns a custom name to the container that you can use to reference the container within the Docker network. In this case: pmm-server. The –restart option defines the container’s restart policy. Setting it to always ensures that the Docker daemon will start the container on startup and restart it if the container exits. Run this command as root or by using the sudo command. By default, the user name is pmm. Use this option to use another user name. In your browser, go to the server by its IP address. 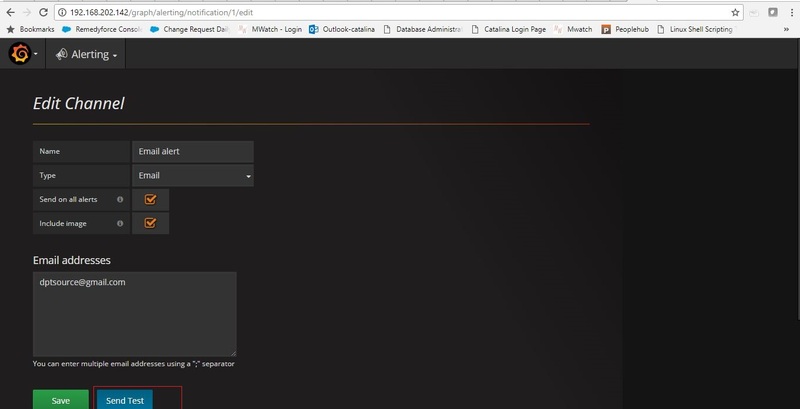 If you run your server as a virtual appliance or by using an Amazon machine image, you will need to setup the user name, password and your public key if you intend to connect to the server by using ssh. This step is not needed if you run PMM Server using Docker. PMM Client is a package of agents and exporters installed on a MySQL or MongoDB host that you want to monitor. The components collect various data about general system and database performance, and send this data to corresponding PMM Server components. Before installing the PMM Client package on a database host, make sure that your PMM Server host is accessible. For example, you can ping 192.168.202.14X or whatever IP address PMM Server is running on. You should not install agents on database servers that have the same host name, because host names are used by PMM Server to identify collected data. If you are running an RPM-based Linux distribution, use the yum package manager to install PMM Client from the official Percona software repository. Percona provides .rpm packages for 64-bit versions of Red Hat Enterprise Linux 6 (Santiago) and 7 (Maipo), including its derivatives that claim full binary compatibility, such as, CentOS, Oracle Linux, Amazon Linux AMI, and so on. 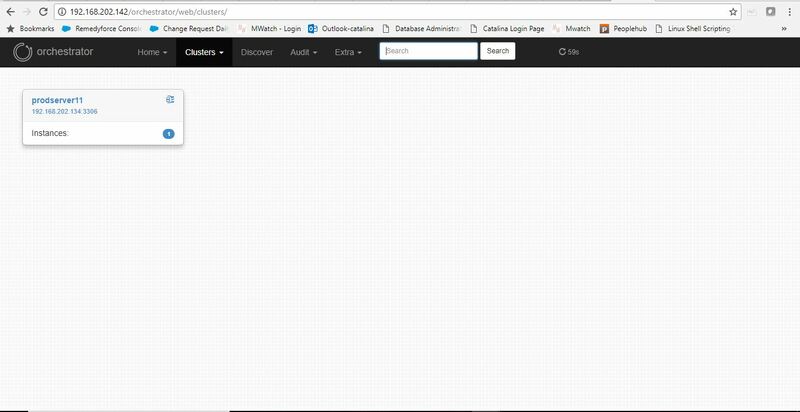 Create a user to collect the metrics from client to server. The superuser credentials are required only to set up the pmm user with necessary privileges for collecting data. Verify that MySQL user exists and has the correct privileges. Use additional flags –user, –password, –host, –port, –socket if needed. You can add multiple MySQL instances to be monitored from one PMM Client. In this case, you will need to provide a distinct port and socket for each instance using the –port and –socket parameters, and specify a unique name for each instance (by default, it uses the name of the PMM Client host). 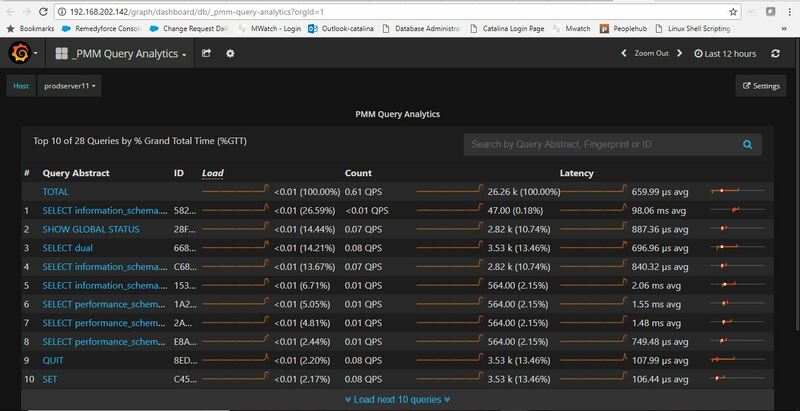 From now on, PMM will capture all the Linux and MySQL metrics from you sever and poll to the PMM Server host, this you can monitor from the PMM Server browser . Use the pmm-admin show-passwords command to print credentials stored in the configuration file (by default: /usr/local/percona/pmm-client/pmm.yml). When you add a monitoring service pmm-admin automatically creates and sets up a service in the operating system. You can tweak the systemd configuration file and change its behavior. Open the systemd unit file associated with the monitoring service that you need to change, such as pmm-mysql-metrics-42002.service. To add an external monitoring service use the external:metrics service followed by the name of a Prometheus job, URL and port number to reach it. 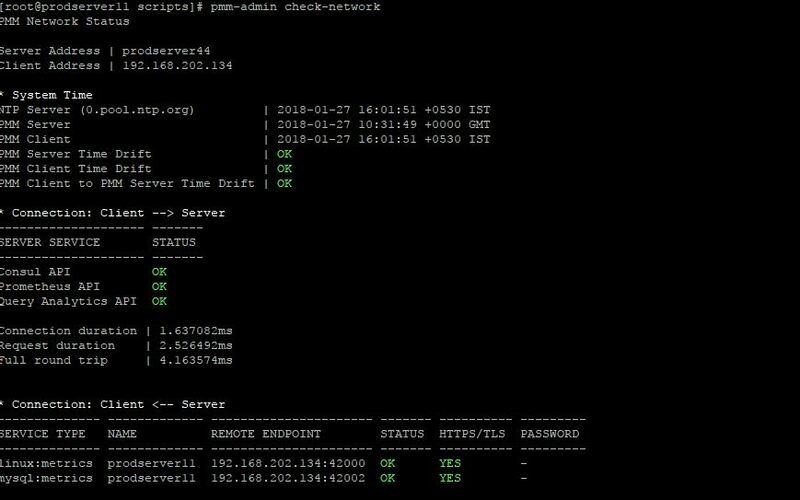 Use the pmm-admin check-network command to run tests that verify connectivity between PMM Client and PMM Server. Pings Consul API, Query Analytics API, and Prometheus API to make sure they are alive and reachable. 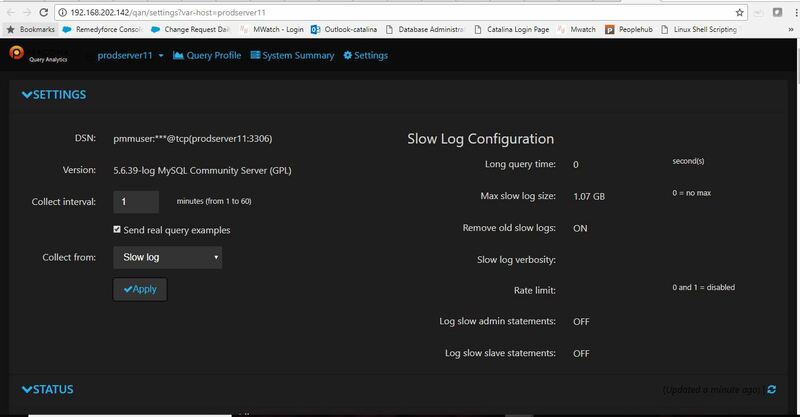 Performs a connection performance test to see the latency from PMM Client to PMM Server. Checks the status of Prometheus endpoints and makes sure it can scrape metrics from corresponding exporters. Use the pmm-admin purge command to purge metrics data associated with a service on PMM Server. This is usually required after you remove a service and do not want its metrics data to show up on graphs. Accessing the Components of the Web Interface. 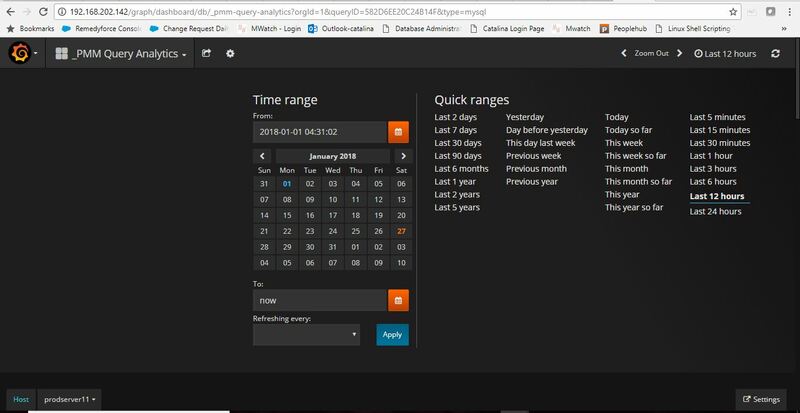 The QAN dashboard enables database administrators and application developers to analyze database queries over periods of time and find performance problems. QAN helps you optimize database performance by making sure that queries are executed as expected and within the shortest time possible. To start working with QAN, open the list of dashboards on the PMM home page. Then, select a host in the Host field at the top of the page from the list of database instances. where the PMM Client is installed. The list of queries opens below in a summary table. Be default, QAN shows the top ten queries ranked by %GTT (Grand total time) as a result of monitoring your database server for the last hour. Each query displays three essential metrics: Load, Count, and Latency. 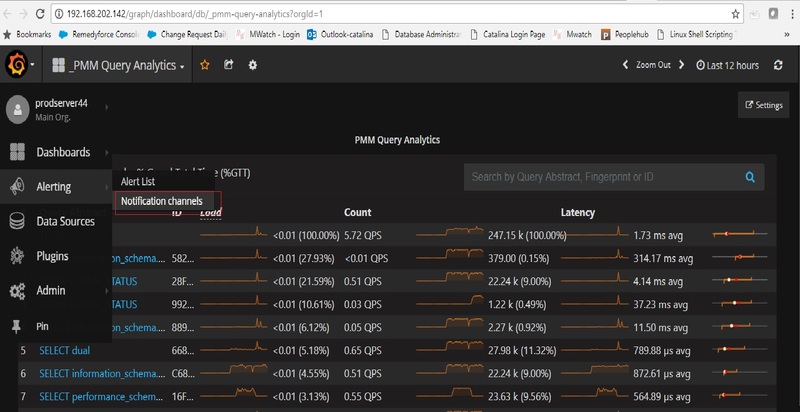 The query metrics that appear in QAN are computed based on a time period or a range of dates. The default value is the last hour. The Settings button opens a separate page with settings, status, and log for the selected database instance. The Settings tab displays the essential configuration settings of the database server selected from the Databases list. From this tab you can see which DSN is being used as well as the database server version. The PMM System Summary dashboard shows detailed infromation about the selected host (the value of the Host field) and the database server deployed on this host. The System Summary section contains details about the platform while the Database Summary offers detailed statistics about the database server. The default source of query data for PMM is the slow query log. It is available in MySQL 5.1 and later versions. 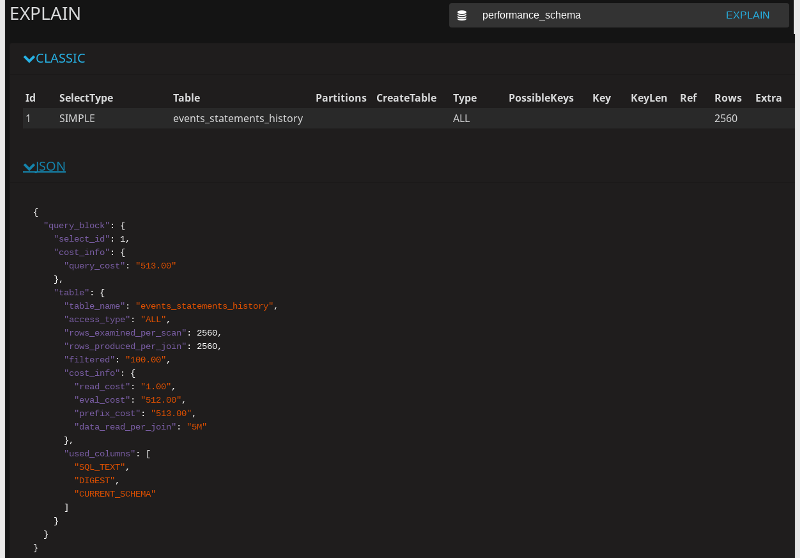 Starting from MySQL 5.6 (including Percona Server 5.6 and later), you can choose to parse query data from the Performance Schema. Starting from MySQL 5.6.6, Performance Schema is enabled by default. The Metrics Monitor tool provides a historical view of metrics that are critical to a database server. Time-based graphs are separated into dashboards by themes: some are related to MySQL or MongoDB, others provide general system metrics. Each graph has a graph descriptions to display more information about the monitored data without cluttering the interface. 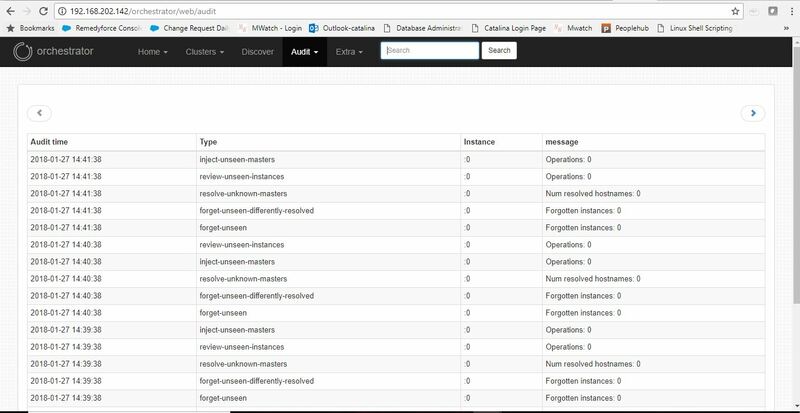 Orchestrator is a MySQL replication topology management and visualization tool. If it is enabled, you can access it using the /orchestrator URL after PMM Server address. The credentials in the previous example are default. If you use a different user name or password, you have to pass them when running PMM Server using the ORCHESTRATOR_PASSWORD and ORCHESTRATOR_USER options. 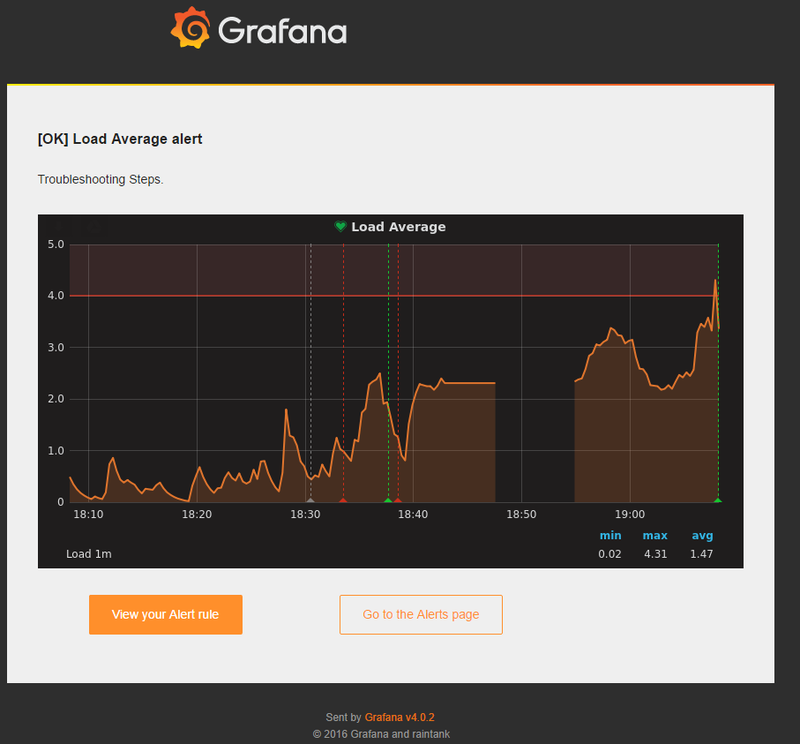 There are several ways to receive alerts with Grafana – email, Slack, Webhook and PagerDuty. To enter the Docker container, use the ID of the running container found with the command “docker ps”. Once you have the container ID, enter the Docker shell by using the command docker exec -it CONTAINER_ID /bin/bash. 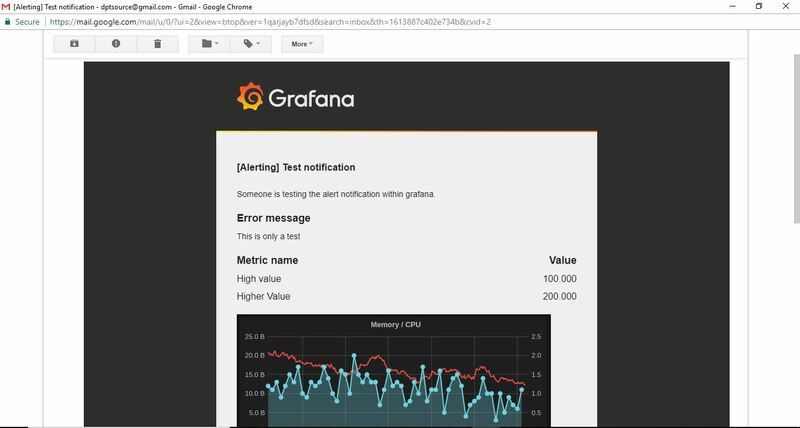 There are also instructions for setting up other alerting methods on Grafana’s website(http://docs.grafana.org/alerting/notifications/) . Once you have made changes to the config file, you can restart pmm-server to pick up the changes with a docker restart pmm-server command. You can test your server’s configuration by clicking the “Send Test” button. 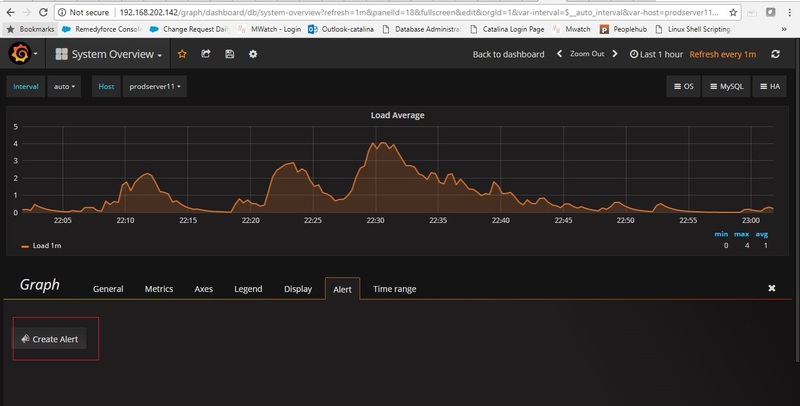 Now that you’ve updated your Grafana config file and tested to ensure your SMTP settings are correct, it’s time to set up an alert for a specific variable. Select the “Create Alert” button. In the Alert Config section, you can modify the frequency at which the alert checks for a trigger and the conditions to trigger the alert . Alerting doesn’t support template variables yet. However, there is a feature request on Github to add this functionality in the future. Because of this, template variables must be removed from the Metrics tab of the dashboard you are editing. To check the version of PMM Server, run docker ps on the host. Docker images for all versions of PMM are available from percona/pmm-server Docker repository. When pulling a newer Docker image, you may either use a specific version number or the latest image which always matches the highest version number. After you have pulled a new version of PMM from the Docker repository, you can use docker run to create a pmm-server container using the new image. Check if the new container is running using docker ps. After you have tried the features of the new version, you may decide to continupe using it. The backup container that you have stored (Creating a backup version of the current pmm-server container) is no longer needed in this case. When PMM Server is run via Docker, its data are stored in the pmm-data container. To avoid data loss, you can extract the data and store outside of the container. Create a backup directory and make it the current working directory. In this example, we use pmm-data-backup as the directory name. Stop the running pmm-server container. Rename the pmm-server container to pmm-server-backup. The last step creates a new pmm-data container based on the percona/pmm-server:latest image. If you do not intend to use the latest tag, specify the exact version instead, such as 1.5.0. Change the working directory to the directory that contains your pmm-data backup files. To make sure that the new server is available run the pmm-admin check-network command from the computer where PMM Client is installed. Run this command as root or by using the sudo command. Check network connection between PMM Client and PMM Server. Configure how PMM Client communicates with PMM Server. Print help for any command and exit. Print information about PMM Client. List all monitoring services added for this PMM Client. Check if PMM Server is alive. Purge metrics data on PMM Server. Print passwords used by PMM Client (stored in the configuration file). Clean up PMM Client before uninstalling it.